LIMITED OFFER: 33% off! Get it today! A great devotion - even if all you have is a minute! - "The best minute you can spend all day!" * Customizable text options for size, color, etc. Away from home? In a hospital or place without a proper crucifix? 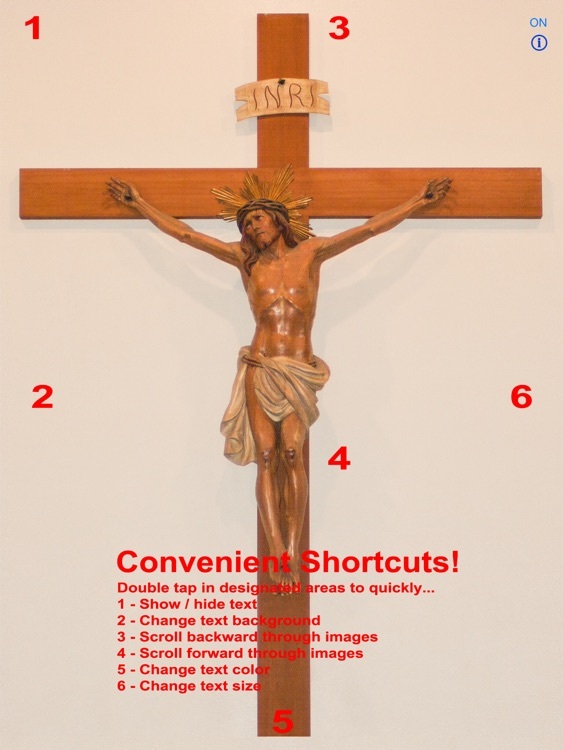 Crucifix too difficult to see clearly? No more! With My Crucifix for the iPad®, you may never have to be away from that precious reminder of God's love for you. 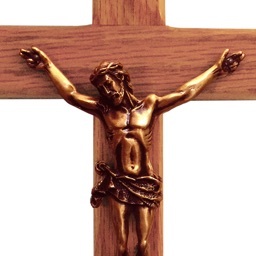 With My Crucifix you can be strengthened & instructed by Christ's sufferings 'anywhere, anytime'. 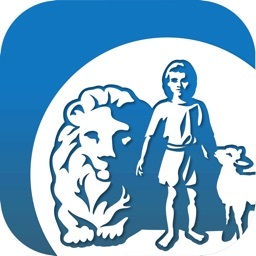 Even if you have only a minute, this app can still be very spiritually beneficial. In fact, sixty seconds meditating on Christ's passion may be the "best sixty seconds you can spend on your soul all day outside of Mass, Confession, and the like"! As St. Paul of the Cross suggests, "Take the holy crucifix in your hands, kiss its wounds with great love, and ask Him to preach you a sermon. Listen to what the thorns, the nails, and that Divine Blood say to you. Oh! What a sermon." 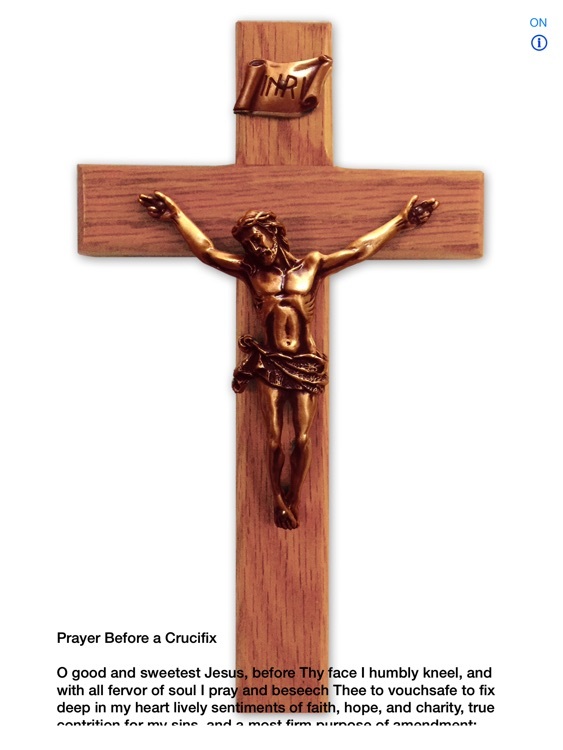 With My Crucifix you can enjoy many benefits of this precious devotional item without having to be at home or in church. 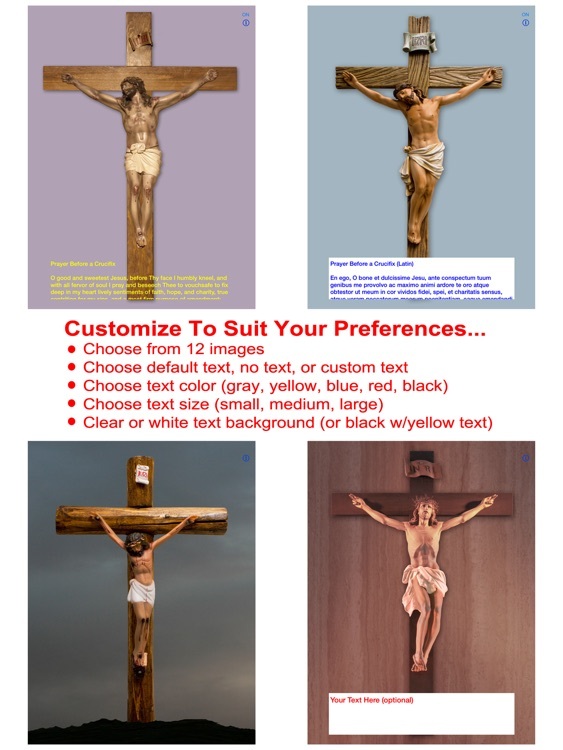 My Crucifix contains 12 images to choose from or add your own+. 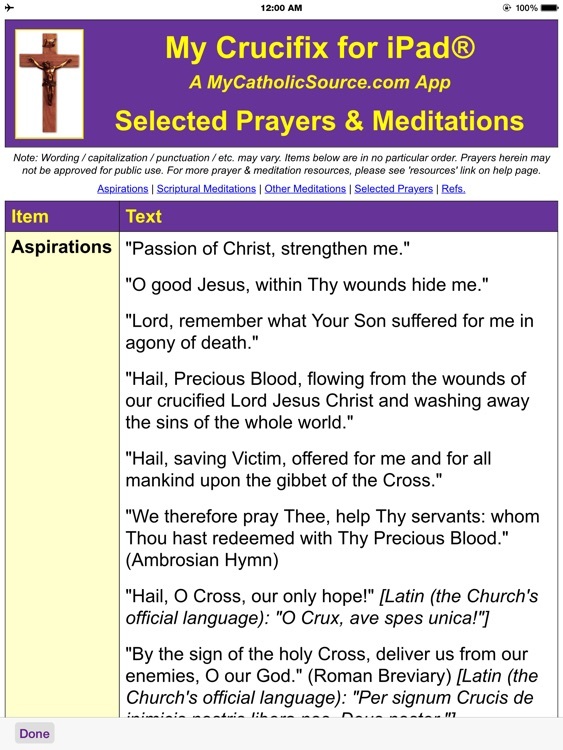 It offers the option to display the traditional 'Prayer Before a Crucifix' (or optionally, add your own text). Keep the screen on (override auto-lock settings) if desired. 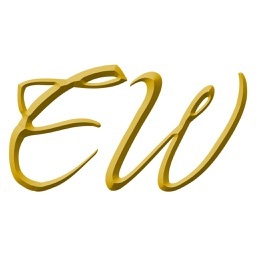 Enjoy a variety of aspirations, scriptural & saintly meditations & other prayers to assist with devotion. Use My Crucifix to strengthen, instruct and comfort yourself whenever you're away from home or whenever you're not near a crucifix. St. Bonaventure, Doctor of the Church, pointing to his crucifix: "This is the source of all my knowledge. I study only Jesus Christ, and him crucified." 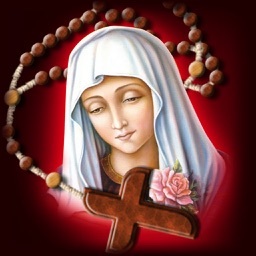 * This app is NOT a sacramental, nor is this app a replacement for a traditional crucifix. 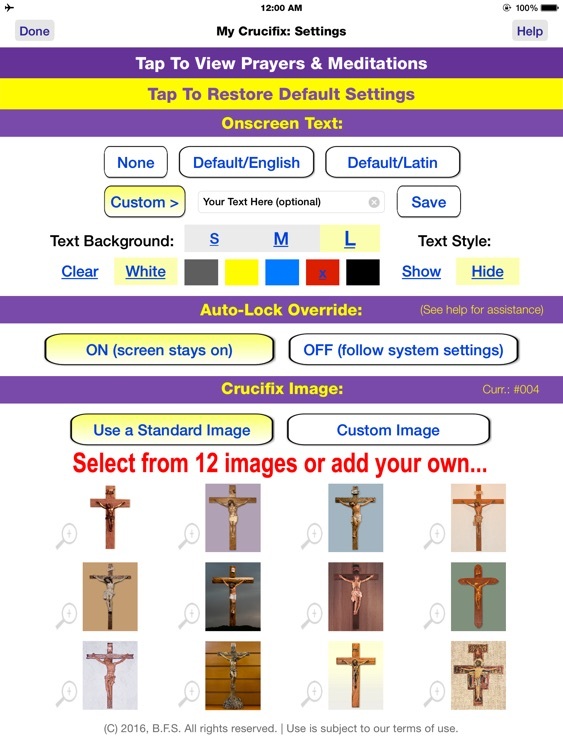 * To obtain some indulgences, it may be necessary to use an actual crucifix/blessed crucifix (NOT this app). * This app is designed for private use only (NOT for use in church). * App is geared toward Catholics of the Latin rite ("most Catholics", "by far the largest rite, and larger than all others combined"). * By default, auto-lock override is set to 'ON'. * This app is designed for silent meditation (app contains NO audio). 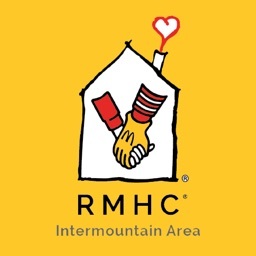 * Appearance of images may vary (for smaller devices, consider the iPhone® version). * + Special Bonus Feature: This version includes an option to take a custom image via a (LIMITED) built-in camera feature.